We are reckoned as one of the most sought after manufacturer, supplier and wholesaler of Leather Products. 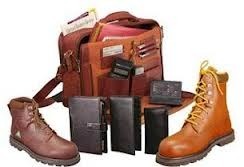 Our products catalog comprises Leather Shoes, Belts, Laptop Bags, Executive Bags and Executive Folders. In addition to these, we also offer Ladies Handbags, Planner Diary, Wallets, Key Chains (all leather), Safety Shoes, Executive Shoe & Leather Chappals and Sandals. The products offered by us are made from 100% pure and high quality leather sourced from some of the known suppliers. Using such superior grade raw material ensures the high quality standards and long lasting usage of these products. For supplying perfect products, our infrastructure is installed with several advanced machines like binding, stitching and gluing machine. Our endeavor to provide high grade products at appropriate prices has won us the trust and repute of several customers. We are also facilitated with a highly advanced TQM unit, to ensure the flawlessness throughout the production process. Our skilled and innovative R & D team, puts all its efforts for finding ways to improve available product range while creating newer ones. We also facilitate our clients with easy transactions, by accepting payments in Cash and DD.